Mid-March to early April 250 Hardin County fifth grade students will be learning the fundamental principles of entrepreneurship and how they could someday start a business of their own. Again with great partnerships of the Hardin County Farm Bureau, Ellsworth Community College, Hardin County 4-H, Thiesen’s and the Hardin County Community Endowment Foundation (HCCEF) this program is entering its seventh year. The Entrepreneur for a Day Program (E4D) is a visionary education and economic development strategy designed to enable youth to become successfully “employed” by starting and owning their enterprises. E4D also incorporates the “Ag in the Classroom” program by having a guest speaker explain how he/she is an entrepreneur with their job in agriculture. Understanding the need to nurture and foster these innate, creative abilities at a young age, the sponsors of this program are dedicated to teaching students about business planning, financial literacy, marketing concepts, work place concepts, social responsibility, and team-building skills. During the two-day program, which was designed and tested by the John Pappajohn Business Center in Mason City, trained facilitators will visit the students’ classroom and introduce the terms and concepts of entrepreneurship. 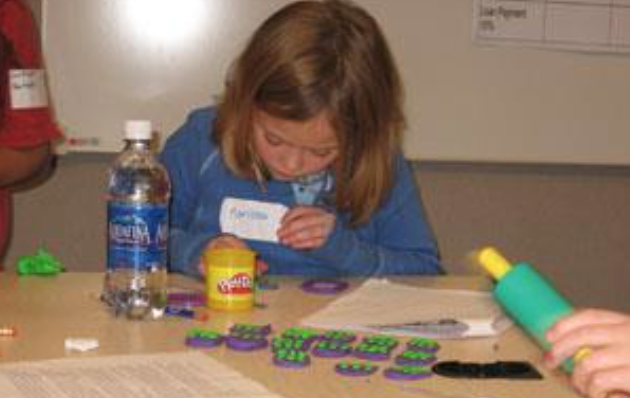 The second day, 5th graders will visit Ellsworth Community College’s Agriculture and Renewable Energy Center in Iowa Falls, where they are put into teams to build a business, based on items they design with molding play dough. An entrepreneur is randomly chosen within that group of 4-5 and through his/her leadership the group chooses to make a specific product out of play-dough. The team will create a business plan, borrow money from the bank, buy resources they will need to make the product, use quality controls, market the product, sell the product and then determines if they made a profit. At the conclusion of the second day the students will tour the Agriculture and Renewable Energy Center and Equine Center. For more information about E4D, strike up a conversation with any Hardin County fifth grader and see what product they designed! For more information, contact the Endow Hardin County Community Foundation.